I found that much work has been done on the Adcock family tree by my father in law Kenneth Adcock’s niece Lilian Adcock. Her tree goes back to Christopher Adcock (1779-1850) and his wife Elizabeth Sarah Simmonds (1794-1866) who came from Leicestershire and Oxford respectively. They both died at Port Elizabeth, South Africa. They had 7 sons and 2 daughters. Of these John Henry (1830-1896) married Emma Pateman and had one son Wilfred Henry (1871-1924) when they were living at 27 Loudown Road, South Hampstead when he was working as a coal merchant. Wilfred Henry emigrated to South Africa, married Lillian Forbes and had 6 sons and one daughter. He died in 1924 in a motorbike accident. There is a bowling green in East London named after him. 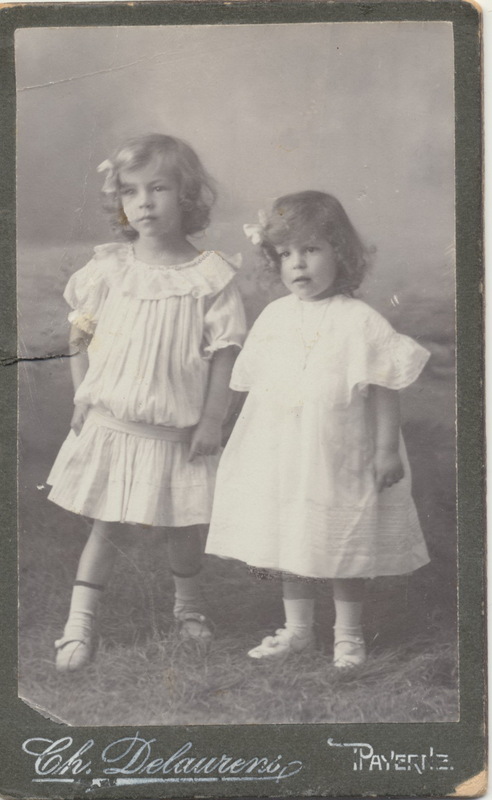 Their son Kenneth Alexander (1909-1993) married Marthe Barbezat in 1936; their children, my wife Cherry and her brother James were born in Nairobi. James can remember going to visit his grandmother in South Africa after the war-the family flew from Mombasa by flying boat, which caught on fire on landing. Kenneth worked for export / import merchants Mitchell Cotts, eventually running their Kenya businesses. He was awarded an O.B.E. and became the Belgian Honorary Consul. In his retirement he was the Chairman and Secretary of the Katharine Bibby Hospital in Mombasa, housed next to the Fort; he also helped James set up the Bahari Club for big game fishing. James subsequently operated the business with a number of fishing boats from Mtwapa and later on a smaller scale at Watamu. James married Susan Crabtree in 1971 a few months before I married Cherry. Their son Kenneth Jnr is a marine engineer working on boat management in the Gulf, and their daughter Rachel is a language teacher in Suffolk. 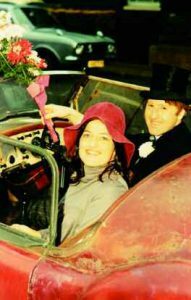 Richard and Cherry in a rusty MGA after their wedding at St. Mary’s, Mortlake. I had met Cherry when I was about 9 when the Adcocks came to stay during Kenneth’s long leave every 3 years or so as paying guests at my grandmother’s flat at 9 B Lexham Gardens. Later Cherry took a degree in French at Bristol and then did a Dip. Ed at Oxford. Her parents’ African servants thought she was particularly backward since she required so much education. She then worked at schools in Mombasa and I met up with her again when she came to London to work at St Saviours & St Olaves in the New Kent Road in 1969. We were married at St Mary’s Mortlake on 25th September 1971 and had our reception in my grandmothers’ garden at 49 Kings Road, Richmond. Marthe Barbezat (1902-1996) known by her Swiss relations as Ninette, but to her family and friends as Barbie, was born in Payerne, Vaud, Switzerland. It became apparent when I started to research her early history and that of her parents that there had been a wall of silence over these early years. Family members only found out the Christian name of her father as a result of my enquiries; and indeed some of the Barbezat cousins are now talking to each other after 30 years. I never intended to be such a catalyst for change! It is really a story of social convention and Masonic rules in a small town. The Barbezats were chemists in Payerne. 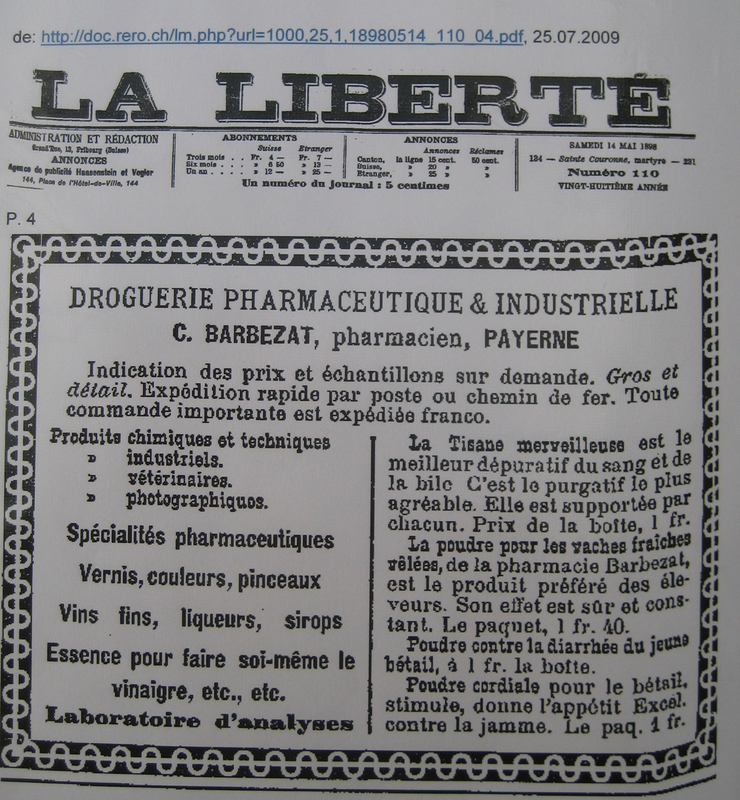 Jean César Barbezat (1841-1923) probably set up the business. He was at the Geneva Academy in 1861/2 and a Lieutenant and Medicine-Adjout in the Swiss army in 1864. He was followed in the business by his son César. 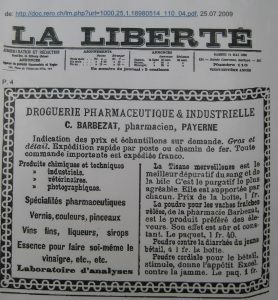 who was quite an entrepreneur; his advertisement in the local paper, La Liberté of 14 May 1898 proclaims his wares in a similar way to our Macassar forbears. Unfortunately he also speculated on the stock market unsuccessfully and had to be bailed out by his Masonic colleagues. By 1914 César was working on making condensed milk, possibly with a view to getting some of the business after the Nestlé Company merged with the Anglo-Swiss Condensed Milk Company in 1905 and created a virtual monopoly; he needed large quantities of sugar and arranged for a cargo to be freighted by sea from Turkey. Unfortunately the First World War intervened, the Turks impounded his sugar and César lost a second fortune. This time the Masons were not so obliging. He was drummed out of town and disappeared. Possibly he went to France and was lost in the war, or went to America. My researches have revealed a blank so far. Of course the family broke up. Roger was despatched to Germany to make his way as a hotelier; he started as a doorman. He also worked in England, had a hotel in Lons le Saulnier, Jura and a sports shop in Cannes. Jean went to college in Payerne, and then emigrated to the Cameroons, which for him lived up to their reputation of being the white mans’ grave. 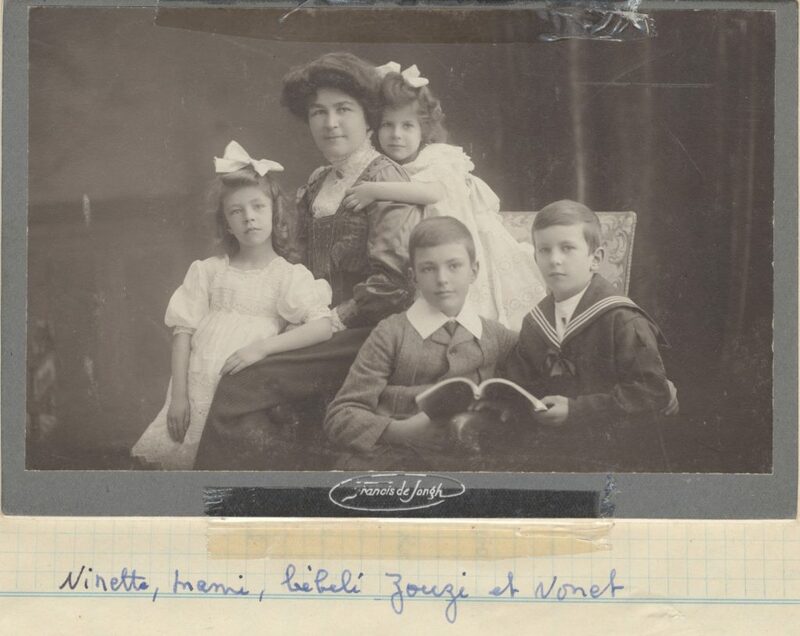 Helene, known in the family as “ Trot” because she was always on the move (not the trots in the English sense) was taken in by the Guillemin family at Yverdon. She later went to London and trained there as a nurse. She along with her siblings were each left Sw Fr 10,000 from the sale of their grandmothers house, which financed her training. In 1927 she met Marcel Golay at New Year celebrations. Instantly he decided she was the one for him, and took her off to the woods, returning late to work the next day at his watchmaking job. To the day 3 years later he proposed, and they were married 18 months later. Barbie was housed with the Jomini family in Avenches, and subsequently at Nyon. They were cousins of her mother and related to Baron General Jomini (1779-1869) who had a celebrated military career, with Marshall Ney at Austerlitz and Ulm, and with Napoleon at Jena and Eylau. He also joined the Russian army, creating a problem for him when war between France and Russia broke out. He went back to Ney at Bautzen, but was with Tsar Alexander in Paris in 1915, when he tried in vain to save Ney. His final action was at the siege of Varna in the Russo-Turkish war in 1828. Later he was military adviser to the Tsar in the Crimean war. He retired to Passy near Paris and wrote extensively on military matters. He died without issue. Possibly the Jominis, with their famous forbear considered it beneath them to have to bring up an “orphan” whose father had disgraced the family. In any event Barbie was very unhappy with them and left as soon as she could, possibly with that legacy, to study nursing at St Thomas’ in London. She never returned to live in Switzerland and never told us about her life in Payerne, Avenches and Nyon. She always loved co-incidences; one involved Helene who on a visit to London met a lady on a train who happened to know Barbie. Helene subsequently stayed with this family in Redhill. Barbie obtained British nationality and then went to India for some private nursing work, before going to East Africa. Her stories of nursing in the bush, with a gun by her side to scare off the lions, and dances with the Sultan of Zanzibar were always entertaining. (She always asked us to put up our hands if we had heard them before; we never did) She worked later at the Katharine Bibby Hospital in Mombasa where she went to dances at the Tudor Hotel with quite a racey crowd; she talked fondly of characters like Pink Gin Bentley and Nelson Balenger. There she met Kenneth Adcock. 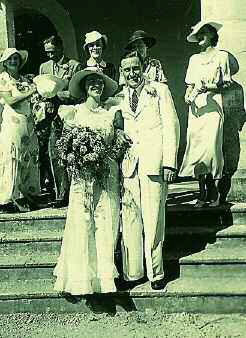 They were married at the Anglican Cathedral in Mombasa in 1936. They spent most of their long married life in Tudor, Mombasa and Nairobi. 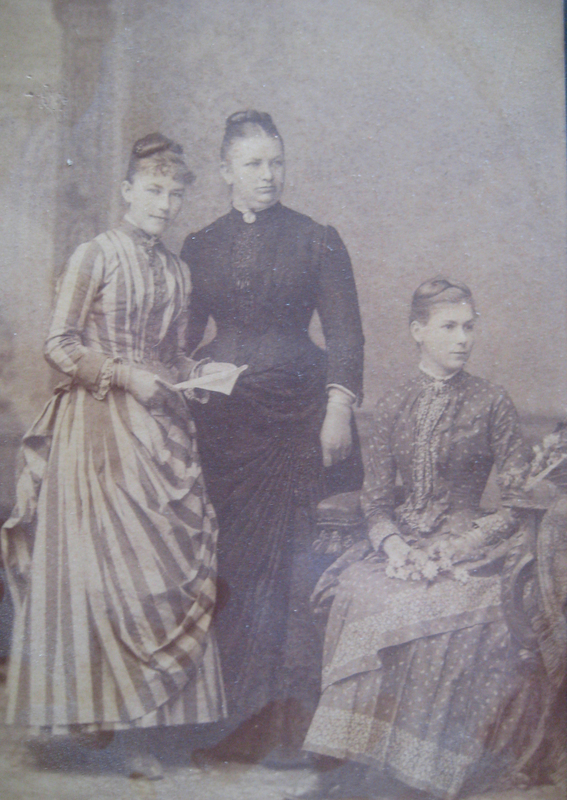 Barbie returned to Switzerland regularly for holidays with her sister, often in Murren. There was a family story that she owned a valuable forest in Switzerland, alas untrue!